Is it really that time already? This year has flown by, and this weekend is our one year anniversary! I think that time feels like it's going really fast because SO much has happened to us in one year. We got married, moved across the country, Josh graduated flight school, we moved across the world and both started ridiclously time consuming and hectic careers. Yikes! No wonder I feel so tired. It's been a whirlwind year, but I wouldn't trade my little family of 2 for anything. The best thing I've done is marry a wonderful man. He's the best, and we are so blessed that sometimes I just sit down and soak it all in. He's given me a wonderful life, an opportunity to experience the world and a year full of wonderful memories. Happy Anniversary, Babe! Maybe I'm feeling sentimental, or just amazed that we have done so much in one year...but here is the annotated version of "The Browns- Year One!" April: Our wedding was everything we hoped it would be, and after nine months of planning we were glad to see the day come. It was such a wonderful day shared with the people who mean the most to us. We spend two days after the wedding at the Juan De Fuca Cottages, which we would recommend to anyone and everyone. Our view was beautiful! Then, we loaded all of my things (that had been residing in a storage unit for months) into a big moving truck and jetted off to Jamaica. We stayed at an all inclusive resort which was a total blessing. After the stress of planning a wedding I was glad to not have to plan or organize anything! We laid on the beach, hung out at the swim up bar, and spend a whole day just watching movies in our room because it was pouring down rain. May: In May I started working, which was wonderful. I found some great families to nanny for and loved the relaxed nature of my job. Spent most of my days by the pool, baking, or playing school with the kids. Josh was still really busy with his schedule, as we were in the final stretch of flight school. I was happy to be working and not bored at home! June: In June Jamie came to visit Alabama, which was a blast. We went to BamaJam, which is a yearly country music festival in Enterprise, where we were living. We camped, barbequed, played beer pong and listened to some great concerts. Our favorite was Dierks Bentley. This was also about the time we found out our great friends Brandon and Heather were pregnant! Yay! July: July was just another month for us. We were loving the warm weather in Alabama and having a great summer with friends. We hosted a Fourth of July party which was lots of fun and included watching the fireworks, finding a lost puppy, having bicycle races around the neighborhood and many games of beer pong, of course! This was also about the time we learned that we would be moving to South Korea! August: August was a crazy month, to say the least. Mark and Luke, two of Josh’s brothers, came to stay for about two weeks and we had an AWESOME time! I was still working I was hanging out at the pool with four kids and loving it. The weather was warm so we spend lots of time outside at the pool, in the sprinkler, barbequing and playing around the playground by our house. We also did board games, lots of puzzles, video games and things like that. Josh’s last official day of flight school (before the weeks and weeks of paperwork) happened when the boys were there so we made big posters for Josh and hung them in the living room as a surprise when he came home. We also did LOTS of driving. The boys flew into and out of Atlanta, which was about a four hour drive, each way. But, the most fun we had driving was to DISNEYWORLD! It took us about seven hours to get there, with plenty of snack and bathroom breaks. 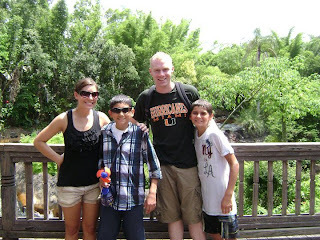 Josh and I had been to DisneyWorld before, but it was SO much more fun with kids. We were all exhausted and halfway through our trip decided that afternoon nap time was mandatory! Haha! We would go to a park in the morning and after lunch time take a nap, go to the resort pool and they go to another resort. 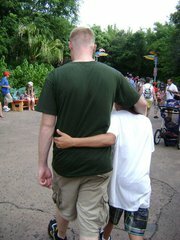 We stayed in DisneyWorld, so every night a park was open until about 2 o 3am, which was super fun! This was an awesome trip! One of my favorite pictures from the trip. On the way back to Alabama. We were barely out of hte parking lot before they fell asleep! Josh also graduated flight school (YAHOO!!!) so we had lots of family in town. Graduation...the day that Josh had worked so hard for! September: September was the first full month Josh was in Korea and I was in Alabama, so there really isn’t too much to talk about. Josh was busy getting acclimated with his unit and Korea in general, and I was working and spending time with friends to keep busy. But, this is how military life goes- the segmented life of time when you are together and time when you are counting the days until you are together again. October: October was very similar to September. Josh was busy with courses to get him ready to fly in Korea and I was nannying for the cutest little newborn girl you’ve ever seen. November: November brought good news as I was able to come to Korea! I sold my car a few days before I left, had everything packed into crates and shipped to Korea, scrubbed the house from top to bottom and spend my last few days with friends and preparing to leave the country. I was in Korea just in time for Thanksgiving, and we sure had lots to be thankful for. Being back together was wonderful and a perfect gift right in time for the holidays. Unfortunately, I was VERY sick after arriving in Korea and was in the hospital twice. We were worried my tonsils would have to be removed, but thankfully they did not. 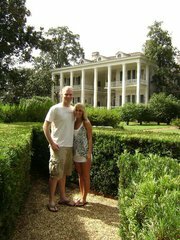 I was slowly recovering from all the sickness when Josh and I found our house. We were given a pretty short time to find a home and after we saw three, we knew that the first was the one for us. Josh was very busy with work so I was meeting with our realtor and landlord and getting things ready. Our home was brand new, which was wonderful and horrible all at the same time. There was lots that needed to be done, but we had a say in those things which was really nice. We moved into the house at the end of November. The outside of our home. December: December was a great month. We were so happy to be back together just in time to celebrate our first Christmas a married couple. Josh was feeling settled at work and really enjoying it. We were enjoying Korea, except for the insanely cold weather, and trying to explore as much as we could. In the middle of December I found my job! My realtor told me she had connections for me when I was ready to look for a teaching job and so I called her one evening. She gave me the number of another client of hers, who I also called. We talked about the possibility of tutoring, and she had many options for me, but I really wanted to work at a school and be back in the classroom. We hung up and about one hour later she called me back. One of her friends had called her and said that two teachers at her school had up and left in the middle of the night, and not come to school that day (this is actually pretty common with people who come to teach in Korea, as the working conditions are really strict and not very accommodating.) This school was looking for an immediate substitute until the end December. I was given the principals phone number, and we spoke that night around 10pm. She asked me to come to the school the next morning to speak with her and see if I was a good fit for the substitute position. The next morning I was pleased to see that the school was close to our house (about a 10 minute bus ride.) After talking to the principal in a VERY informal interview (So you went to college? To be a teacher? Wow! Do you like to teach? Do you like social studies or science teaching better? Do you plan on getting pregnant anytime soon?) I was offered a job less than an hour after I walked in the door. Total blessing. I worked a full day and four days later we agreed on contract conditions and I was a full time working teaching. Funny how different teaching is in Korea, huh?! 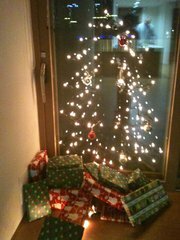 January: In January our household goods finally arrived so we were able to make our house feel like a home. Finally, this move started to feel permanent and not just like an extended vacation. I also started tutoring adults in English, something that I really enjoy. It’s a nice change from teaching kids all day. Josh was also able to fly A LOT, which was awesome. We were both working like crazy, but really loving it, too! February: February was a fun month for us because we did lots of exploring around Korea. The weather was getting a bit nicer (well, I should say more bearable, because it’s April now and STILL cold) so we were able to get out and explore the many smaller cities around our house. We went to the Korean Folk Village and learned more about Korean history. I also went to a Korean wedding ceremony, as one of the ladies I work with got married. In February Josh left for a three week training and we celebrated Valentine’s Day!! Josh was promoted to CW2 this month, but his ceremony was not for another 5 weeks. March: I feel that I could say that every month is crazy, but they really are. Josh and I both work about 10 hour days (minimum) and so during the weeks life goes on as normal with working, cleaning, making dinners and lunches and watching movies together before bed. But, this month was pretty fun because we both celebrated our birthdays. We are feeling so lucky that we are able to have these special days together during our first year of marriage, as we were sure at this point Josh would be deployed and we wouldn’t have these days together. We had nice birthday dinners out and explored some new areas to celebrate. Josh also flew quite a bit, and was very busy with additional duties at work. But, of course, he is doing great and really enjoying his work. 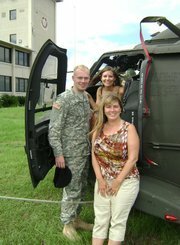 Also, Josh had his promotion ceremony for Cw2- it was an awesome day and I was so proud to be there!!! April: Wow! Can you see why I feel like one year has gone by so quickly? Writing everything down helped me to realize just how much has happened for us in one year, and how blessed we really are. We have a wonderful anniversary dinner planned for Sunday night, and I will be sure to post pictures of our evening out! !